FRANKFORT, Ky. (AP) — A bill allowing those Kentucky school districts known as Districts of Innovation to develop new standardized testing models cleared its first panel Tuesday. 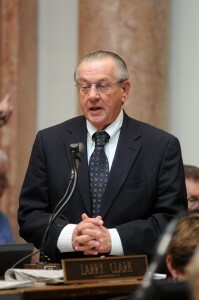 House Speaker Pro Tem Larry Clark, the bill’s sponsor, says it would affect seven Kentucky school districts. Clark says the measure is an outgrowth of the 2012 Districts of Innovation law allowing schools to apply for waivers of regulation as they develop alternative curriculum models. Clark says his bill builds on this by exempting those schools from statewide assessment testing and allowing them to develop alternative assessment methods that meet state standards. “This bill will simply allow Districts of Innovation to apply to the state board of education to use an alternative assessment mechanism rather than the existing statewide assessment,” said Clark. The bill cleared the House Education Committee on a 26-0 vote. It now moves to the full House for consideration.